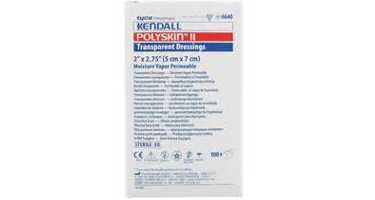 Navigate: Store / Dressing/Tape/Prep / Kendall Polyskin Transparent Film Dressing 2"x2-3/4"
Kendall Polyskin Transparent Film Dressing 2"x2-3/4"
Kendall transparent film dressings consist of a thin polymer film coated with a hypoallergenic adhesive. Its simple, effective delivery system allows one-handed application, rounded edges will help prevent rollup. The outstanding barrier to bacteria and fluid contaminants make the Kendall film dressing ideal for I.V. sites, donor sites, burns, ulcers and sutures.